MIAMI GARDENS, FLA. - After the confetti had dropped, after the tears were shed, after they stood in front of the cameras and the microphones and tried to put the greatest night of their professional lives in perspective, Sean Payton and Drew Brees shared a quiet moment together. They hopped on the back of a golf cart, each with a hand on the shiny silver Vince Lombardi Trophy that rested in Payton's lap, each with a wide grin across their faces. "Don't you just want it to slow down and last longer?" the coach said to his quarterback. Lucky for them, the feeling won't go away any time soon, now that the New Orleans Saints have become Super Bowl XLIV champions for the first time in their 43-year history, thanks to a thrilling 31-17 victory over the Indianapolis Colts at Sun Life Stadium on Sunday night. The victory party will last into the early morning hours today and spill into a championship parade Tuesday evening that will meld into the most exuberant Mardi Gras week the city has ever seen. The champions of the world call New Orleans home. Who would have believed Dat? "New Orleans is back, and we showed the whole world!" Owner Tom Benson exclaimed on the stage at midfield, as the thousands of Who Dats in attendance screamed their approval. Payton followed him, saying there wasn't enough room on the stage for all the players who made it happen, and then he turned the microphone over to Brees, introducing him as "the MVP of this Super Bowl and the MVP of our league." It's hard to argue after Brees' brilliant performance on the game's brightest stage. To earn that trophy, the Saints had to navigate their way through three potential Hall of Fame quarterbacks in Arizona's Kurt Warner, Minnesota's Brett Favre and Indianapolis' Peyton Manning. Brees was better than all of them, especially Sunday night when he directed the go-ahead touchdown drive and two-point conversion midway through the fourth quarter. "It's unbelievable. I mean it's sunk in, but I don't know if it's really sunk in yet, " said Brees, who said he doesn't usually have trouble sleeping but admitted that he couldn't sleep the past two nights as he ran through all the possible scenarios he might face in the game. Then it happened for real Sunday, when the Saints took over possession from their 41-yard line with 10:39 remaining, down 17-16. After a 12-yard run by tailback Reggie Bush, Brees took over. He completed all eight of his pass attempts over the next nine plays to eight different receivers, including a 2-yard touchdown strike to tight end Jeremy Shockey and the two-point conversion toss to receiver Lance Moore, giving the Saints a 24-17 lead with 5:42 remaining. "Listen, we spread the ball around all year long. You never knew when it was gonna be time for someone else to step up, " said Brees, who completed 32 of 39 passes for 288 yards with two touchdown passes and no interceptions. "And I can't say enough about our offensive line, going up against one of the best pass-rushing defenses in the league." Manning -- the league's regular-season MVP -- couldn't match Brees' heroics. MIAMI GARDENS, FLA. - Sunday started in New Orleans with the Rev. Monsignor Crosby W. Kern celebrating Mass with a Drew Brees jersey underneath his vestments. 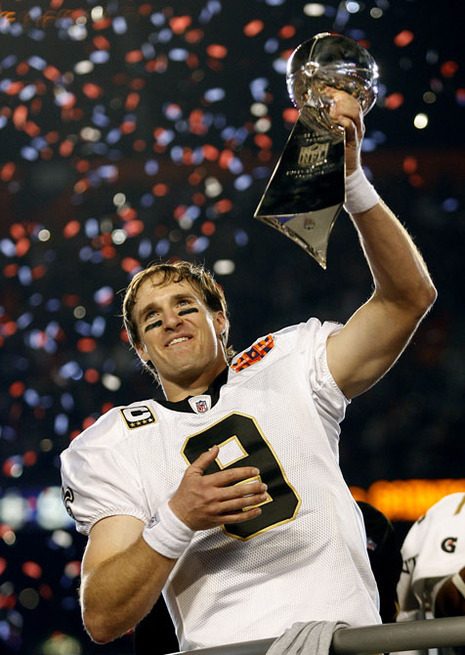 It ended in Miami Gardens with Brees standing atop a gridiron altar to accept the Pete Rozelle Trophy as the MVP of Super Bowl XLIV after his near flawless performance led the New Orleans Saints to their first world championship. They elected a new mayor in New Orleans on Saturday. They will crown a new king of Carnival next week. But New Orleans is and forever will be Brees' town. He'll never buy another drink, never purchase another meal and never pay another parking ticket. It's his faubourg. We're just living in it. The Saints quarterback etched his place in city legend alongside Bienville, Iberville and Armstrong with one of the great passing performances in Super Bowl history. His 32-of-39, 288-yard, two-touchdown masterpiece vanquished the Colts and four-time league MVP Peyton Manning, who heretofore was known as New Orleans' favorite son. It also successfully completed what Brees called "a calling" when he signed with the franchise as an unrestricted free agent four years ago only months after Hurricane Katrina devastated the city and region. "This is incredible, " Brees said. "I mean, are you kidding, are you kidding me? Four years ago, whoever thought this would be happening? It's unbelievable." Unbelievable would be an accurate way to describe Brees' performance in the final three quarters against the Colts. The man who set the NFL record for accuracy this season was an uncharacteristic 3-of-7 for 27 yards in the first quarter. The rest of the way, he completed 29 of 32 passes for 261 yards, two touchdowns and an extra point. Two of his incompletions were a spike to stop the clock and a dropped ball by Reggie Bush in the third quarter. Brees saved his best for last. With the game on the line, he engineered a drive that will be remembered by Saints fans for all eternity. With the Saints trailing 17-16 with 10 minutes to play, he completed all seven of his passes for 40 yards in a nine-play, 59-yard scoring march that put the Saints ahead for the second time all night. Each completion went to a different receiver. Pierre Thomas for 5 yards. Jeremy Shockey for the final 2 and the go-ahead touchdown. Then for good measure, Brees hit Lance Moore for the two-point conversion. Eight passes, eight receivers. None of the completions traveled more than 9 yards. How's that for finishing strong? "He was spectacular, " Shockey said. "His performance was awesome, " Saint guard Jahri Evans said. "He's been awesome all year, and today he showed it." Brees' heroics fueled a nearly perfect final three quarters of football from the Saints, who spotted the Colts a 10-0 lead, then stormed from behind as they had all season. His 32 completions tied the Super Bowl record set by Tom Brady of the New England Patriots against the Carolina Panthers in 2004. On the same field where he directed one of the greatest comebacks in club history against the Miami Dolphins three months earlier, he guided the Saints to scores on five of their six series in the final three quarters. They were a failed goal-line play away from going six-for-six. "He just led, " Saints receiver Colston said. "I'm just so proud of that guy and just so happy to be just associated with greatness in that way." The signature victory completed an impressive postseason hat trick for Brees. In consecutive games, he outdueled a trio of future Hall of Fame quarterbacks: Kurt Warner, Brett Favre, and, finally, Manning. His numbers in those three contests were staggering: 72 completions in 102 passes for 732 yards, eight touchdowns and zero interceptions. His passer efficiency rating was 117.0. "Brees was magnificent tonight, " Saints Coach Sean Payton said. "He played so well, so efficiently. He was fantastic. He was fantastic all year. He's just a winner. Everywhere he's been, he's won it. And now he's won it for us." Payton might as well have spoken for all of the Saints nation with those words. Maybe those "Breesus" shirts weren't so blasphemous after all. MIAMI -- Who dat blew dat? A grand season and a great start crashed down around the Indianapolis Colts on Sunday night at Sun Life Stadium. They charged into a 10-point lead, then went into a dead stall as the New Orleans Saints dominated the final three quarters to win Super Bowl XLIV 31-17. As the orange and white confetti swirled and many in the Saints-dominated crowd of 74,059 celebrated, the Colts struggled to choke down a bitter end to a bountiful decade. The won six division titles and 115 games, more than any team in any decade in NFL history. They started this season 14-0 to run their winning streak to an NFL-record 23, but there was a single title, a victory in Super Bowl XLI after the 2006 season. "There's only one happy team at the end of the season," Colts coach Jim Caldwell said. "You don't get any trophies for the regular season." Saints quarterback Drew Brees, a former Purdue All-American, was 27-for-30 over one stretch and finished 32-for-39 for 288 yards and two touchdowns. Brees tied the Super Bowl record for completions and broke the mark for completion percentage (82.1 percent). He was named the game's Most Valuable Player. "We were playing for so much more than ourselves," Brees said. "Four years ago, who ever thought this would happen? Eighty-five percent of (New Orleans) was under water. Seventy-five percent of the residents were evacuated to other cities." The Saints played in the Super Bowl for the first time in their 43-year history. They played for "Who Dat Nation," a community torn asunder by Hurricane Katrina in 2005 and brought back together, to some extent at least, by the healing spirit engendered by their efforts. Mardi Gras began early this year, on South Beach shortly after the game. Prior to Sunday, only one team in Super Bowl history had overcome a 10-point deficit to win. Washington was down 10-0 before beating Denver 42-10 in Super Bowl XXII. The Saints were almost as dominant. They outscored the Colts 31-7 after trailing 10-0. It was no sure thing with a little more than three minutes to play. The Colts trailed 24-17 but were threatening. They had a third-and-5 at the Saints 31. Wide receiver Reggie Wayne ran a quick slant. Saints cornerback Tracy Porter, a former Indiana University standout, anticipated the route, recognized the route, jumped the route. He cut in front of Wayne, grabbed Peyton Manning's pass and sprinted 74 yards for the clinching touchdown. 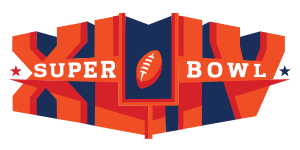 MIAMI -- For all the records Peyton Manning and the Indianapolis Colts have set the past decade, they're now on the wrong side of a Super Bowl mark. Much of the blame for that falls on an offense that was dormant in the second quarter and mainly inept after a strong start. The Colts managed only 15 yards on six plays in the second quarter and only seven points the final three quarters in allowing New Orleans to tie the record for largest comeback in Super Bowl history. The Saints matched the mark by the Washington Redskins, who came from 10-0 down to beat Denver 42-10 in Super Bowl XXII. The Saints outscored the Colts 31-7 after the first quarter to win Super Bowl XLIV 31-17 Sunday night at Sun Life Stadium. "We probably never got into a great rhythm," Manning said after throwing for 333 yards but just one touchdown and a game-sealing interception that was returned for a score. The Colts were moving the ball in the first quarter, getting a field goal on their first possession and touchdown on their second. What made Colts offensive failure even more surprising, they were running the ball the first quarter better than they had during the season when their ground game ranked last in the league. Joseph Addai, who did not have a 100-yard rushing game all season, ran for 58 yards in the first quarter. On the Colts' first possession of the second quarter, Pierre Garcon dropped a pass on third-and-4. Punt. After their defense managed a goal-line stand, the Colts again went three and out when Mike Hart was stopped for no gain on third-and-1. "It's frustrating when you're not moving the ball," Colts receiver Austin Collie said. "Like I said, we didn't do enough to win. That's the bottom line. We just didn't do enough to win." Colts receiver Reggie Wayne, who was born in New Orleans and attended John Ehret High School, understood what the Saints' victory meant to the region. "You've got to take your hats off to the Saints, the job they did coming into this game, getting the 'W,' giving the city something to smile about," Wayne said. Wayne was thrown to 11 times, most of any Colts receiver but had only five catches for 46 yards. The Pro Bowl receiver aggravated a right knee injury in Friday's practice. "My knee wasn't bothering me at all," Wayne said.